If you had asked my 10 year old self what her biggest and wildest dream was, she would have told you it was to witness the next Miss America be crowned. Until about 4 months ago, that was still by most desired dream. It wasn’t until after I had been given my state title, that it was decided my mom and I would be traveling to New Jersey to watch the show live and in person. However, I was given this gift in a honor that was more than I ever imagined to exist. That honor was to not only cheer for our Miss Wisconsin, Tianna, but to do it as Miss Wisconsin’s Outstanding Teen. Before I go further I have to tell you all how much I missed the rest of my Outstanding Teen sisters. Weeks had passed where we did not see eachother, and this was the first time that we would be reunited again! We had so many activities planned together like mini golf, the show me your shoes parade, lunches, and watching the Miss America prelims. There was never a dull moment when we were together. There’s a feeling that you get when one of your dreams become a reality, and watching the second night of prelims was no acception. I think I almost broke my vocal chords from cheering so loud, but I couldn’t contain my excitement. The fangirl inside me came to life and I was taking it all in. From how beautifully set up the stage was, to seeing all of the behind the scenes and cameras, I was enchanted. The environment was magical. I had always imagined myself competing for Miss Wisconsin one day. 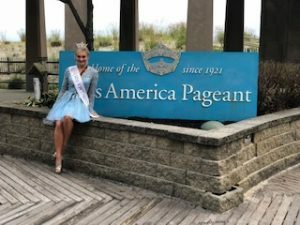 Experiencing Miss America 2.0 was the key point in helping me realizing that it was something I had to do. 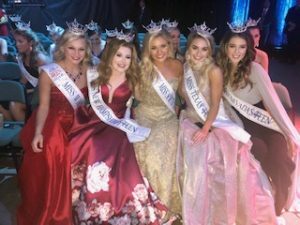 There was always this misconception that Miss America was more beauty than brains, but after all of the changes that occured within the system, I think we can see that Miss America now is someone who is beautiful, both on the inside and out. While in Atlantic City I had the opportunity to meet with a woman who showed what beauty truly is, and that was Miss America 2018, Cara Mund. My mom and I had been given the opportunity to partake in a tour which included meeting the hosts of Miss America, Ross Matthews and Carrie Ann Inaba, watching a small portion of a rehearsal, and getting the chance to meet Cara Mund. She was kind, incredibly sweet, and in a few short words showed her intelligence, and exactly why she spent her last year as Miss America. This encounter only made me more excited for finals night, which let me tell you, there will never be enough words to describe how surreal it all felt. The outstanding teens and I all sat front row at Miss America, so to say the least we had a pretty great view! The best way for me to describe what finals night felt like is by comparing it to sitting front row at a concert of your favorite artist, but times 1000! The strangest thing was that you could see all of the cameras and monitors around you, but instead of watching it on a T.V. screen, the show was just a few feet in front of you. For those of you who may not of had the chance to watch the show this year, I can tell you that Wisconsin was represented by one of the best. I apologize if you were watching my instagram live, because I was jumping up and down so much you may not have been able to see most of what I was recording. However just a small recap, Tianna made it into the top 15! After all of the Miss America Festivities were over, I can tell you that this system is one created by hundreds of powerful, intelligent, and hardworking women who changed the world in one way or another. When the time for me comes to compete in the system, I know that it will change me for the better. One last time I want to say congratulations to Tianna, you’ve made us all so proud!